A rescue operation is underway after a boat carrying up to 950 migrants, including hundreds of women and children, capsized in Libyan waters, 120 miles south off Lampedusa. Numerous casualties are feared as only a few dozen people have been saved so far. Twenty-eight people have been reported rescued, while a number of bodies have been washed ashore in Libya. The official death toll stands at 24. Italian prosecutors say a survivor from Bangladesh told the authorities that the boat had been carrying 950 people when the incident occurred. Previously, authorities believed that the vessel contained around 700 people. “There were 950 people aboard, about 40-50 children and 200 women,” local media quoted Catania Prosecutor Giovanni Salvi. Based on a Bangladeshi man account, some 300 people were in the hold at the time of the accident. 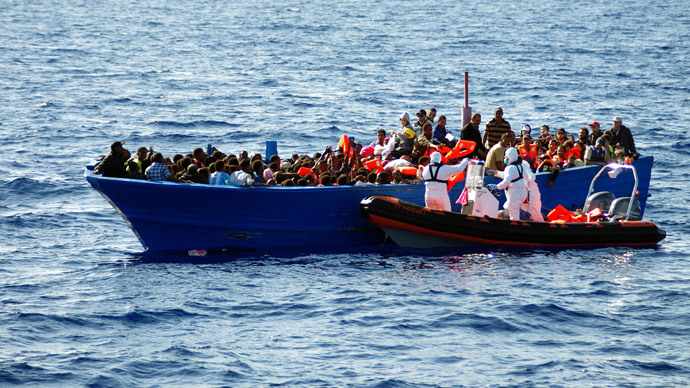 The disaster in southern Mediterranean could become one of the worst in decades. "At the moment, we fear that this is a tragedy of really vast proportions," Carlotta Sami, a spokeswoman for the UN High Commissioner for Refugees, told SkyTG24 television. "The first details came from one of the survivors who spoke English and who said that at least 700 people, if not more, were on board,” Sami added. A Maltese Navy spokesman told the BBC that Italian ships and commercial boats were also involved in the emergency operation. The operation is focusing on the search for bodies. Italy's Prime Minister Matteo Renzi says Italy cannot handle the increasing migrant traffic on its own.“We are asking not to be left alone,”he told reporters at an impromptu cabinet meeting. He added that search and rescue operations are not sufficient to save the migrants’ lives, and traffickers should be stopped from sending boats from Libya’s coast in the first place. European Council President Donald Tusk is considering calling a special summit of EU leaders to tackle the refugee crisis in the Mediterranean. The final decision on whether to call the emergency gathering will be made after consultations, Donald Tusk’s spokesman said. A few days earlier, almost 400 migrants drowned in the Mediterranean as their boat carrying 550 people bound for Italy capsized approximately 24 hours after leaving Libya. The flow of migrants has increased due to fine spring weather over the last few weeks. 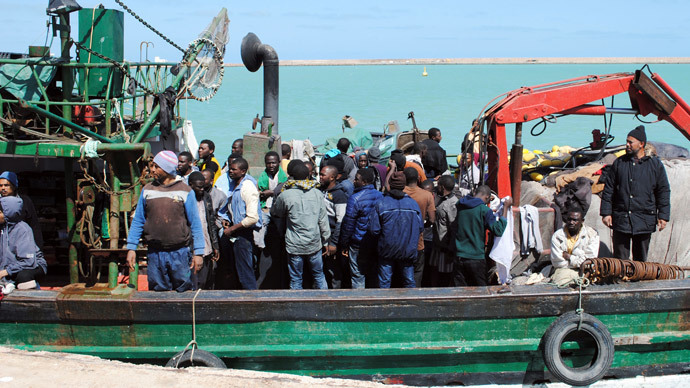 About 20,000 migrants have made it to the Italian coast this year, according to estimates by the International Organization for Migration (IOM). Libya has been largely lawless since the toppling of Muammar Gaddafi four years ago, and criminal gangs send vessels to carry migrants from Africa and the Middle East. His fall was greatly assisted by EU and US support of opposition forces, including a bombing campaign. Catherine Shakdam, the associate director of the Beirut Center for Middle East Studies, told RT that European countries should now take responsibility for the migrants' lives: "I can understand that migration has become a problem in Europe, but you are talking people's live here. Women and children, civilians, are dying because they are desperately trying to escape economic hardship and a warzone. And I think that Europe... has to take responsibility, because they have somehow created that chaos."